“I want to invent a new age car that produces oxygen when it runs”. Ngan Vo, a year 10 student from Dong Nai shared her dream. Her father passed away before she was born, since then her family of four have been moving between places. They are currently boarding at her 80 year old grandmother. Ngan’s mother suffers from critical illnesses resulted from her toxic working condition at a local factory. Her illnesses are untreated due to financial difficulties and she’s waiting for the bomb to tick. Ngan is passionate about caring for people and the environment she lives in. She works during school recess and lunch breaks picking up the rubbish, plastic bottles and glasses and resell them at the recycle depot. She wants to set good examples for other students and uses extra money to help poorer students or buying materials to … fix the potholes on the roads! “I know other friends who are smarter and face more difficulty than me”. Said Ngan when we offered her the scholarship. 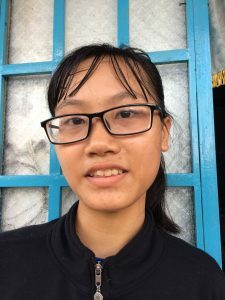 Help Ngan so that she could help others to achieve their dreams. There are 180 students need sponsorship, please give a gift of potential this Christmas for only $1/day!